Studio Line: MGM - A film about humanity. "Poignant, penetrating [and] scathingly hilarious" (Long Beach Press Telegram), Crimes and Misdemeanors is a deftly rendered tale about the complexity of human choices and the moral microcosms they represent. Showcasing Allen's brilliant grasp of the link between the funny and the fatal, his 19th movie, Crimes and Misdemeanors, is "one of the watershed films of his career" (Los Angeles Times). Cliff Stern (Woody Allen) is an idealistic filmmaker… until he's offered a lucrative job shooting a flattering profile of a pompous TV producer (Alan Alda). Judah Rosenthal (Martin Landau) is the pillar of his community… until he learns that his ex-mistress (Anjelica Huston) plans to expose his financial and extramarital misdeeds. As Cliff chooses between integrity and selling out, and Judah decides between the counsel of his rabbi (Sam Waterson) and the murderous advice of his mobster brother (Jerry Orbach), each man must examine his own morality, and make an irrevocable decision - that will change everyone's lives forever. DVD: Widescreen 1.85:1/16X9; audio English Monaural, French & Spanish Monaural; subtitles French, Spanish; closed-captioned; single sided - single layered; rated PG; 104 min. ; $19.98; 6/5/01. After the consecutive horrors of 1987’s September and 1988’s Another Woman, I greeted the prospect of another Woody Allen drama with extreme trepidation. After all, my three prior experiences with the Woodman’s more serious fare - including 1978’s Interiors - had all been miserable; I genuinely loathed all three of these flicks. I knew that C&M enjoyed a better reputation than the others, but I still felt extremely wary of it. Happily, C&M offered an experience that was infinitely more engrossing and compelling than anything I found in the prior three films. Although C&M is a definite departure from Allen’s earlier movies, it seemed more in keeping with them, which is why it worked so much better than its dramatic counterparts. Two main factors made C&M function at a higher level than Allen’s other dramas. For one, it wasn’t purely a drama. Take a look at September, Another Woman or Interiors and you’ll find virtually no attempts at humor in them. These were so deadly serious that Allen sucked any potential life out of them; it was as though he was so eager to distance himself from his reputation that he refused to acknowledge the existence of comedy. That’s clearly not the case with C&M. Actually, the movie’s a little split in that regard, as it provides two storylines that differ in tone. One of these - which is the more dominant of the two - sticks almost exclusively with dramatic material. That one views an optometrist, Dr. Judah Rosenthal (Martin Landau), whose public life seems perfect, but who has some problems that are hidden from the world. Actually, this issue isn’t horrific, but it has the potential to cause him serious grief. For some years, he’s conducted an extramarital affair with Dolores (Anjelica Huston), a flight attendant he met on a business trip. She believes that Judah has promised her a life together, and when he tries to back away from her, she threatens to tell his wife and blow his marriage to bits. Understandably concerned, Judah struggles to decide what to do, and he consults a variety of parties. Literal good and evil are represented by his choices. He talks to a rabbi who’s a patient of his. Ben (Sam Waterston) tries to talk Judah through his problems, but Judah just doesn’t seem to be able to accept the options the rabbi presents to him. On the darker side of the coin is Judah’s other consultee, his brother Jack (Jerry Orbach). Jack’s a shady character, and he looks at the matter as a problem to be solved in a very concrete - and illegal - manner. I won’t reveal which path Judah takes, but the film examines the manner in which he handles his dilemma and the results of his choice. Judah’s storyline sticks mainly with high drama, whereas the second running plot offers a lot more comedy, though it seems no less real and effective. In the other tale, independent - and not terribly successful - documentarian Cliff Stern (Allen) has troubles of his own. Not only does his career lack much momentum, but also his marriage is on the rocks. His wife Wendy (Joanna Gleason) and he seem openly combatant most of the time, and it doesn’t help that Cliff can’t stand her famous and popular TV producer brother Lester (Alan Alda). Cliff views Lester as an artistic whore. He denies any jealousy over Lester’s accolades and wealth as he criticizes the apparently-poor quality of Lester’s work. Their paths more closely intertwine when Wendy gets Cliff a job with Lester. He’s to create a documentary about his brother-in-law for a TV show. Cliff begs off the task until he meets the show’s producer, cute and compelling Halley Reed (Mia Farrow). Cliff immediately falls for her, especially when she shows interest in his pet project, a documentary about a philosophy professor. He immediately starts to attempt to woo her, with varying results that also end up in a manner that I’ll leave as a surprise. The tales don’t intertwine until the end, when both men attend the same party and briefly chat together. My desire to avoid spoilers makes it more difficult for me to adequately discuss the issues raised in C&M, but this concluding scene helps tie together the results of the men’s decisions and their reactions to them. While most of Allen’s prior dramas tried desperately to be rich and insightful, C&M actually gets there. It’s a fairly subtle and intriguing film, and it’s one of Allen’s more existential pieces. Throughout much of the movie, he seems to examine the conflict between divine guidance and free will, and he appears to come down more strongly on the side of the latter. The end result is that it looks like Allen says that we more or less choose how we’ll react to stimuli, and the actions themselves contain no inherent moral value. Or at least that’s the way some of the characters attempt to view things. Whether that outlook is ultimately successful is up to the viewer to decide. At times Allen lays on the imagery too thickly, but for the most part I thought he maintained a nice balance in the piece. The humor seemed to be natural and unforced, and that aspect of the film helped make it much more realistic and palatable after the unrelentingly somber qualities of his prior dramas. One other aspect of C&M that I believed helped it to be more successful than Allen’s other dramatic pieces related to the gender of its leads. While Interiors, September and Another Woman all featured female protagonists, C&M focused on men. Of course, women played a strong role in the film, but they mainly existed as the forces that caused the men to act; Dolores and Halley were the primary female roles, and they were the ones who provoked the decisions made by Judah and Cliff. I think that the male emphasis of C&M worked better simply because Allen clearly understands that viewpoint more clearly than he does the feminine side. I’m not saying that any attempt by Allen to more prominently work from the woman’s angle is destined to failure. Hannah and Her Sisters is well regarded, though it’s been so long since I last watched it that I can’t give my opinion of it. Nonetheless, with the possible exception of HAHS, Allen’s other female-oriented dramas have been total disasters, and the change to the masculine point of view really seemed to make a difference for C&M. Actually, men and women contrast rather strongly in C&M. Cliff and Judah have their flaws, but they’re presented as very likable and engaging men. As for the women, Dolores and Cliff’s wife Wendy come across as whiny shrews, and though Halley receives much better treatment, she still shows flaws in the end. I don’t know if Allen was trying to make a statement about women through these characters, but I also felt that the female leads in September were quite surly and unpleasant, even though we were apparently supposed to relate to them. Unlike that earlier film, Crimes and Misdemeanors remains open to a number of interpretations, and it clearly stands as one of Woody Allen’s better dramas. Actually, it’s one of his better movies period, as it provides a nicely rich and involving experience. Allen takes on some serious issues with a deft touch and makes a picture that will be thought-provoking and believable. 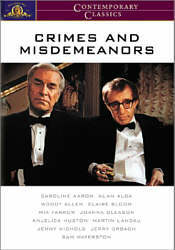 Crimes and Misdemeanors appears in an aspect ratio of approximately 1.85:1 on this single-sided, single-layered DVD; the image has been enhanced for 16X9 televisions. While the picture displayed some occasional concerns, as a whole I thought it offered a very solid presentation. Sharpness appeared consistently solid throughout the film. The movie always presented a nicely accurate and distinct image, and I saw very few instances of any softness. Moiré effects and jagged edges made very few appearances, and print flaws were reasonably minor. At times, I detected examples of small speckles and grit, and some grain interfered with the picture on occasion; the latter concern mainly arose during low-light sequences. Happily, the movie cleaned up as it continued, and the first half displayed more defects than did the second. Even at its worst, however, the flaws seemed to be relatively minor; they could be mildly distracting at times, but this was still a fairly clean picture. As was the case with Allen’s prior dramas, C&M featured a fairly bland, naturalistic palette, as Allen generally avoided bright hues for this somber piece. Overall, the tones looked clear and accurate and they displayed few problems. I thought that flesh tones periodically demonstrated a mildly orange tint, but for the most part they were acceptably accurate. The movie featured a vaguely brown overtone much of the time, and that seemed to affect the accuracy of some hues. Still, the colors worked acceptably well within this design spectrum, and when Allen involved brighter hues - which occurred during a few exteriors - they were quite positive. Black levels seemed to be nicely deep and dark, and shadow detail appeared acceptably visible. That was important due to the prevalence of low-light situations. Some of the latter occasionally came across as mildly murky, but for the most part they seemed well-represented. Ultimately, I thought Crimes and Misdemeanors offered a very nice image that could have been “A” level if it looked a little cleaner. As with virtually all other Woody Allen films, Crimes and Misdemeanors offered only a monaural soundtrack. Despite the limitations of that format, the audio seemed to be fairly clear and robust. Not surprisingly, dialogue was by far the most significant aspect of the mix, and the speech appeared appropriately warm and natural. All lines were distinct and crisp, and they lacked any edginess or problems related to intelligibility. Effects remained quite minor throughout the film, as they were restricted to quiet ambience for the most part. The loudest element came during a thunderstorm, and that portion of the mix sounded reasonably accurate and clear. I thought the thunder lacked much dynamic impact, but it still was reproduced with acceptable fidelity. Music played a much stronger role during C&M than it did in September and Another Woman. Although much of the music remained in the background, and the film lacked a consistent score, a few scenes featured accompaniment, something we didn’t see during the prior flicks. Quality appeared to be fine, as the tunes sounded acceptably warm and rich. Ultimately, Crimes and Misdemeanors didn’t provide an active auditory experience, but it showed solid clarity and the sound worked well for the film. Apparently Woody Allen doesn’t care for DVD extras, which is why none of the DVDs for his films include many. That is also the case for Crimes and Misdemeanors. All we find are some moderately interesting production notes within the four-page booklet and also the movie’s theatrical trailer. Despite the lack of substantial supplements, Crimes and Misdemeanors merits a look. The movie is one of the rare dramas from Woody Allen that isn’t overbearing, pretentious and miserable. In this film’s dual stories, Allen paints a compelling picture of men and how they deal with various significant pressures, and the results remain open to differing viewpoints and interpretations. I found the movie to be provocative and stimulating. The DVD offers quite solid picture and sound, with the disc’s weak complement of supplements becoming the only sore spot. Nonetheless, with a low list price of $19.98, the absence of these components seems less problematic, and the high quality of the movie makes it a desirable property. Note: Crimes and Misdemeanors can be purchased on its own or as part of the Woody Allen Collection 1987-1992. The latter also includes Another Woman, September, Alice and Shadows and Fog. Unlike packages such as The Oliver Stone Collection or The New Stanley Kubrick Collection, 1987-1992 tosses in no exclusive extras, but its list price of $83.96 is about 16 percent off of the separate cost of all five movies. As such, it would be a nice bargain for anyone who wants all of the different films.